In transmedia storytelling, one of the most important components, according to Andrea Phillips, author of A Creator’s Guide to Transmedia Storytelling, is worldbuilding, which “is all about conveying information about the time, place, and mood of your story.” Making the world your story exists in seem authentic and thought out is essential if you want your audience to become emotionally attached and involved in the characters and themes you are developing. One of the most widely successful franchises that have attempted (and succeeded at) worldbuilding is definitely J.K. Rowling’s Harry Potter saga and the extensive wizarding world that has been built around it. Within the Potter universe exist several artifacts from within the wizarding world, such as maps and several books written from the perspective of wizards, such as Fantastic Beasts and Where to Find Them and Quidditch Through the Ages. Although these help to extend the the confines of the world considerably, Phillips advises that “in transmedia storytelling, the most effective tool is to actually create a small piece of your world and give it to your audience to play with.” This is exactly what has been done through the creation of Pottermore, a transmedia feat that provided a new chance for fans to be re-immersed into the wizarding world. First, J.K. Rowling starred in a video announcing Pottermore and explaining her reasons for creating it. This was a good move because Rowling is such a well-recognized face to the Harry Potter franchise, and any fan would be sure to hang on her every word. Then another video was released which showed and explained some of the gameplay. There isn’t a verbal explanation of what is involved in the site, but that creates more of a mysterious allure than would a cut and dry breakdown of what the site has to offer. It shows players how the interactive scenery works within the various chapters, as well as potions and dueling. It all started in 2011 with an announcement (in the video shown above with J.K. Rowling) and a puzzle in the form of the “Quill Quest.” Those who completed the quest were allowed to beta test the site months before it actually launched, and by suggesting that only a limited number of players would be admitted for early entry, the creators assured that every Potter fan would tune in to play. 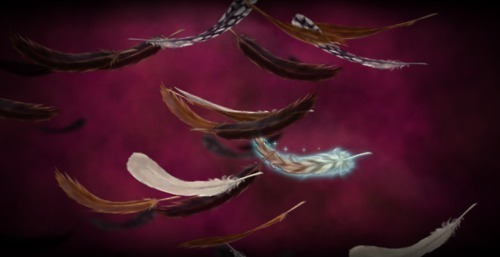 The quest was pretty simple at first and just involved clicking on a single, illuminated feather that was floating amidst several normal looking feathers. Then, after players clicked on the correct feather, they were treated to 7 days worth of riddles to solve (a combination of Harry Potter trivia and math) in order to gain early admittance into the Pottermore site. As an avid fan, I was one of the ones desperately clicking feathers and looking up tiny details from each book, and I have to say that the quill quest, as a marketing ploy to get people excited about the site, was hugely successful. It’s the same concept as those “limited time only” offers that most stores use, and it ensures that the audience will respond much quicker and enthusiastically, because they don’t want to miss out. Then, when the beta testers were let into the site, they were asked to provide feedback on which aspects could be improved, and it’s obvious that the site engineers took players’ opinions into account. 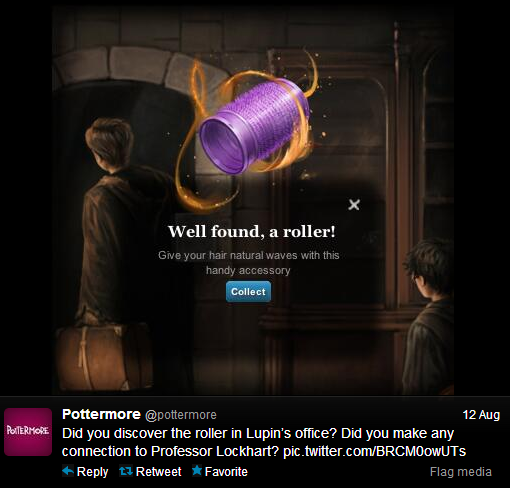 The Pottermore that you see today is much better graphically, and music, sounds, and minigames have been included. In this way, fans felt that they really had an impact and a say in the Harry Potter world that they loved so dearly. Before Pottermore came out, fans had already involved themselves in the magical world in many ways, including discussing the books and movies in online forums, buying merchandise, learning the spells and incantations, and attending fan conventions, but according to Pottermore creator and transmedia guru, Jeff Gomez, the website “brings the Harry Potter brand from its basis in being a repurposed or repeated story world, into being a true transmedia brand.” In addition to the actual website, Pottermore has a YouTube channel, which has videos of J.K. Rowling talking to fans as well as additional videos about new video games like Book of Potions and Book of Spells (which double as collectible artifacts in Pottermore); a Twitter account, which posts high scores from Pottermore users; and a Facebook page which hosts information from every branch of social media as well as announces new products, like eBooks. What really makes Pottermore such a success in transmedia storytelling, according to Gomez, is its level of interactivity. Members of Pottermore definitely influence certain outcomes in the world that has been built for them. Each user is sorted into their respective houses by answering questions written by Rowling, then everyone can contribute to their house’s success by earning house points through making potions or winning duels to help win the collective house cup. 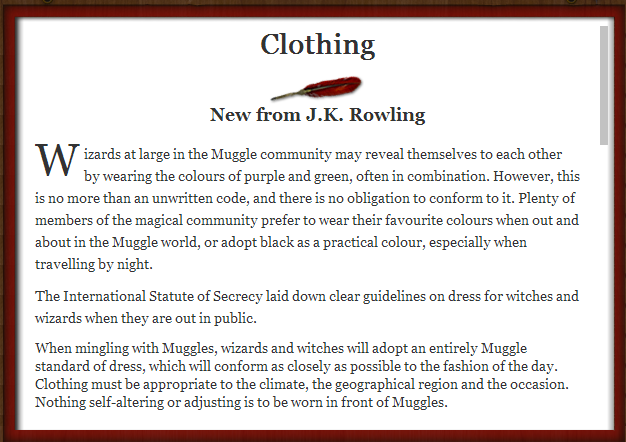 Unlike the books, movies, and other types of worldbuilding in Harry Potter, Pottermore takes it a step further by allowing the player to actually be a member of wizarding society and along the way exposes pieces of the world that had never been seen before, such as maps of certain places, like Diagon Alley, and new information on the world written by J.K. Rowling. Players follow the familiar storyline of Harry Potter’s life through interacting with scenes of certain key moments, which each have 2-3 levels that players can delve into by clicking and zooming into different areas of the scene. But then, they also get to actively participate in ways that have nothing to do with the Rowling’s characters. There are several collectible items hidden among the scenery (such as Bertie Bott’s Every Favour Beans, chocolate frog cards, and Galleons) as well as brand new information about different characters, places, and aspects of wizarding society written by J.K. Rowling herself. Because players have to search and click in order to find and read these extra tidbits, it makes the discovery all the more gratifying, and it also means for fans that the Harry Potter universe is never quite finished, because J.K. Rowling has revealed that there are many back stories and ideas that she never got the chance to flesh out in the books. Then, of course, players also get to be involved in wizarding activities like potion making and dueling, which involve a certain level practice and skill. So far, Pottermore has been a huge transmedia success story since it launched, and with new things coming out more and more often I wouldn’t be surprised if they stick around for years to come.